Asher Benjamin's 1806 book American Builder's Companion: or, A New System of Architecture: Particularly Adapted to the Present Style of Building in the United States of America had a great impact on New England architecture. Our copy is of particular interest because it once belonged to John Nelson (1789-1859), a carpenter and housewright who built or worked on many of the 19th-century homes in Lincoln, Massachusetts. The book is a practical guide to architectural styles, and we can assume that this book was probably used by Nelson as he worked as a housewright and a carpenter. In addition to the book, the National Heritage Museum also owns a number of tools that once belonged to John Nelson. You can see some of them on display in the current exhibition Sowing the Seeds of Liberty: Lexington an the American Revolution, currently on view in our galleries. 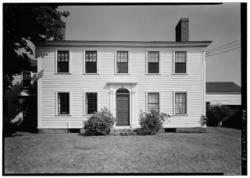 The John Nelson House, pictured above, is located in Lincoln, MA in Minute Man National Park. The photograph seen here is from the Historical Architectural Buildings Survey, taken in 1961. There are more photos available online, courtesy of the Library of Congress' Prints & Photographs Division. -Lincoln Public Library have the Nelson Family Papers in their collection, including a number that relate to John Nelson. A finding aid for that collection is available online. -A digitized version of American Builder's Companion from the University of Wisconsin. Benjamin, Asher. American Builder's Companion: or, A New System of Architecture: Particularly Adapted to the Present Style of Building in the United States of America. Boston: Etheridge & Bliss, 1806.